Why Be Curious? This is a Nebbiolo for true Nebbiolo lovers; one that highlights the graceful, pretty side of the variety rather than its powerful side. 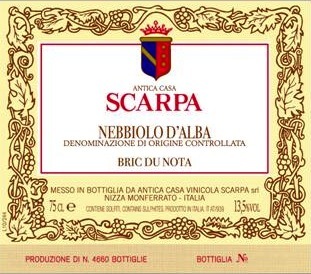 It’s traditional, ultra-elegant Nebbiolo d’Alba from a vineyard in the Roero and released about the time most producers release their Barolos. The extra years of aging in bottle give extra complexity, refinement, and drinkability. Vigna / Vineyard: Bric du Nota is a 2.5 hectare vineyard just outside of Monteu Roero, the highest wine-producing village in the Roero. Cantina / Cellar: Fermentation in stainless steel tanks. Aging for 12 months in large casks (2,000-10,000 liters) and then at least several more years in bottle before release. Il Vino / The Wine: This is exceptionally elegant, almost understated Nebbiolo with the classic Roero perfume (from sandy soils). It’s Nebbiolo as it used to be made — where structure, spices, and minerals are at least as important as fruit. The extra aging in bottle results in a wine that is released when it’s showing the qualities that make good Nebbiolo worth drinking: secondary aromas and flavors and the complexity that comes with age. In most vintages, the wine will continue to improve for years. A Tavola… / At the Table… This is a structured but not hugely tannic Nebbiolo, so it can span first courses like pasta and rice dishes to meat and game. Ettari / Hectares: 2.5 hectares. Suoli / Type of soils: High percentage of sand. Élevage: 12 months in large-wood French oak Gamba casks (botti grandi) of 45HL / 45,000 liters, from three to twelve years old, plus at least two more years in bottle before release.